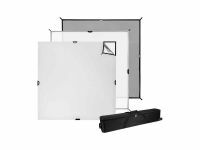 A versatile light modification kit designed for multiple purposes and portability, Westcott's theC47 DP Kit includes the framework to construct a 4 x 4' Scrim Jim Cine frame and three fabrics to block, flag, diffuse, and bounce various light sources. Created in collaboration with Jem Schofield, founder of the popular filmmaking educational site, theC47, this kit is designed for run-and-gun filmmakers and other on-the-go cinematographers as a portable, yet customizable light control setup. A versatile tool for controlling, directing, and blocking light, the Scrim Jim Cine Floppy Cutter Fabricfrom Westcott is compatible with 4 x 4' Scrim Jim Cine frames and features a double-layered construction that unfolds to an overall 4 x 8' size. A heavy-duty touch fastener allows for quick setup and installation with the frame, and also allows you to secure the loose fabric when using as a 4 x 4' flag. The opaque, nearly reflection-free black surface can be used to block ambient light in order to create shadows on your scene or subject. It is also suitable for flagging artificial lighting, preventing light spill, and can be used as a barndoor for larger light sources. Opaque matte black fabric helps to control light, prevent light spill, and create shadows on a scene or subject. Suitable for use as a flag or barndoor for larger light sources. Double-layered design can be unfolded to reveal a 4 x 8' fabric, with 4 x 4' of loose fabric, or folded and secured for use as a 4 x 4' flag. Touch fastener lining secures loose fabric and permits quick installation and removal from 4 x 4' Scrim Jim Cine frames. Duvetyn fabric is also fire-resistant. Allowing you to soften ambient and artificial light sources, this Scrim Jim Cine Full-Stop Diffuser Fabricfrom Westcott is compatible with 4 x 4' Scrim Jim Cine frames and features a heavy-duty touch fastener lining for quick setup and convenient portability. Constructed from nylon and silk fabrics, this diffusion does not affect the color temperature of light sources and helps to maintain natural-looking skin tones. 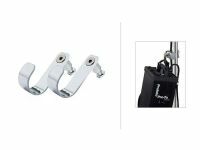 As part of a modular system, this fabric is an ideal light control tool for a variety of both studio and on-location applications. Touch fastener lining permits quick installation and removal from 4 x 4' Scrim Jim Cine frames. A versatile two-sided reflective fabric, the Scrim Jim Cine Silver/White Bounce Fabric from Westcott is compatible with 4 x 4' Scrim Jim Cine frames and features a heavy-duty touch fastener lining for quick setup and convenient portability. This reversible fabric has both bright, cool silver and neutral white reflective sides, allowing you to quickly switch between applications. The silver bounce side adds bright, specular highlights and an overall cooling quality while the white side produces soft, natural looking highlights.